5-stars rating by themselves. They are truly magnificent. into the sky and all over the world. Then the cities grew. Santa had to work all day to make toys for all the good boys and girls. He was so worried he wouldn’t make it on time that his beard turn white! 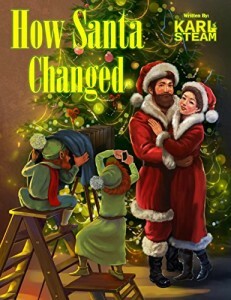 But this story isn’t just a lovely Christmas tale about how Santa became this loveable chubby folk figure, it has a profound message about seeking help from others in times of need. Kids would enjoy reading the story and adults would enjoy it too. I laughed out loud when I got to the last page.